The history of the region was very turbulent and bloody. There were several distinct periods that are covered in this page. There is a scarce amount of historic information pertaining to Imotski county before year 1500. For that reason Imotski county is treated as a part of larger regions as they were reshaped in that period. It has been established that the region of Imotski County has been populated in the Neolithic age. There are many archeological findings of stone axes and sledge hammers in Vinjani and Grabovac as well an urn from Slivno dating from 1500 B.C. The history of the region is still full of unresolved questions. The Illyrians were the first inhabitants of the greater region occupied by the former Yugoslavian state, but most of the data are coming from Greek and then Roman sources. The old Greeks have colonized the fertile coastal regions and a few islands like Vis (Issa) and Hvar (Pharos). Discovery of their coins and few art crafts along the old Imotski county roads suggests they were trading there. It is most likely they were coming from the direction of Vid (Narona). The name of current Dalmatia traces its origin from the Illyrians tribe Dalmatae. They were the largest Illyrians tribe in the region, the other two nearby tribes being Daors and Ardiaei. The tribes lived organized in smaller units connected with family ties. That was dictated in part by the mountainous terrain. There are many Illyrians stone forts and burial stone piles, 2-3 meters high and over 30 meters in diameter all over Imotski county. Many very rich deposits of Illyrians artifacts were found in Postranje and Sebišina, like the two pieces of jewelry on the left. Illyrians were good warriors and they were good in forcing nearby tribes to pay taxes. Romans clashed with the Illyrians in 230 B.C. when the Illyrian started pirating Greek and Roman merchant ships. There were periods of hostility and peace between them so it took the might Roman war machine several centuries to conquer the war oriented Illyrians tribes. Daors, as a smallest tribe made a pact with Romans, endured harassment's from Dalmatae , and eventually helped the Romans to their quests to pacify the Dalmatae. Roman legions led by Octavian defeated Illyrian tribe Dalmatae in 35 B.C. after destroying Illyrians strongholds Promona (Promina), Synodion ( most probably Balina Glavica u Kljacima) and Setovia (most of authors place it east of Klis in today's Studenci ). It took additional 44 years before the final peace came in 9 A.D. After that year there were no more conflicts. Illyrians become very devoted to Rome. They served in Roman armies, first far from home, but later in the region. The army service usually lasted 20 to 22 years after which time the soldiers were honorably dismissed and given land properties. It helped that both nations were multi god believers. 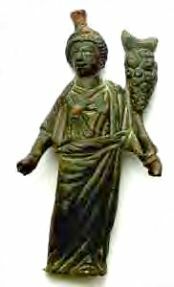 Illyrians kept their gods but started giving them Roman names after the gradual Romanization of the region. The most important gods were Diana, Jupiter, and Sylvan/Sylvania. Illyrians were slowly assimilated by Romans and later by Croats and other Slavic tribes. Illyrians even gave several Roman emperors: Claudius II Gothicus, Aurelian, Diocletian, and Constantine the Great. Today's Albanians are the only direct descendants of the old Illyrians. There is not much known written information about the region from the Illyrian time. Few of the today's geographic entities like mountain Mosor, Dinara, and river Sava are of Illyrian origin. The old Illyrian settlement names were still reflected in the work of well known geographer Claudius Ptolomy ( ca. A.D. 90-168) from Alexandria who has published famous Geography in eight books. he has collected geographic data from the then known world including the Mediterranean region. 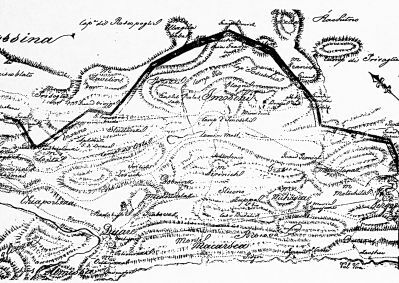 His "Fifth Map of Europe" contains Dalmatia with the following nearby towns: Epetium = Stobreč, Oneum = Omiš, Oiguntium = Podstrana, Andetrium = Muć, Delminium = Duvno, Noabrona Col = Vid, and Salona = Solin. Romans have built several settlements in the Imotski county region, including Emanio from which the Emotha, Imota, Imotski name has been probably derived. Another theory connects old name Imota to italic name Aematis ( Aemate) and greek word Hµoτa. The precise location od Emanio has not been determined. One theory has placed it between today's Borak and Glavina Donja, where many Roman artifacts were discovered. Considering the Roman habit of building settlements near water sources Glavina is more likely, if not some other village. Other well known locations are Proložac, Kamen Most, and Lokvičići, in addition to road intersections at Lovreć and Grabovac. The Romans had many settlements there built for their veterans and colonists. There is a tomb plate dedicated to a member of IX Roman legion in Proložac. 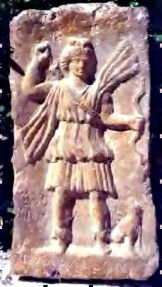 Two of the statues that have been found in that region are a relief with hunting goddess Diane from 2nd century and a statue of Fortune - Izida. 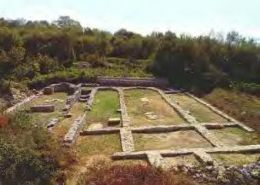 The most important Roman settlement was Ad Novas ( Rus Novae or today's Runović) in municipium Novensium, which was built along side of antic road connecting Salona to Narona. Marco Aurelius was most likely the founder of Novae. Aurelius family name could be found all over the place near Novae. Emperor Marco Aurelius ordered a bridge be built in today's Kamen Most over river Vrljika. Municipium settlements are Roman towns with limited civil rights (civitas sine suffragio), i.e. without being able to vote, but with all other rights. The road building "viae millitares" to facilitate the future conquests started with Augustus and it was largely finished with Tiberius and Claudius. They have reused in part the road system build by Illyrians. The Christian religion appeared on the coastal regions at the beginning of the first two centuries and started making inroads towards the inland. Practicing Christian religion was forbidden at that time. Emperor Diocletian (284-305) was famous for his persecution of Christian believers. Eventually the emperors gave in and with Milan edict in 313 practicing Christian faith is allowed. There were two church "sabor" in Salona in 530 and 533. Sarsenterum, near today's Aržano become the Bishop's seat in charge of the whole Imotski county, Novae being the more eastern point. The other well known place mentions around that time is Montanense ( in Croatian translation "za gvozdom" or today's Zagvozd) that is part of Makarska diocese. 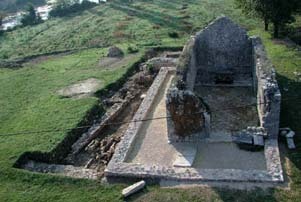 The most important church from that time, built in late 5th century was located in Dikovača (Zmijavci). 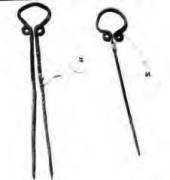 It was discovered in 1897/98 by Don Ivan Tonković. Croats built their basilica in the ninth century there on the Roman church ruins. 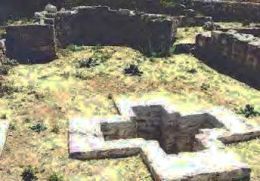 The basilica had attached baptistery with baptismal font in a shape of cross. The basilica also had one baptismal font of smaller proportions, what makes this basilica a rare structure with two baptisteries. It had a relief decoration showing a bible motif, Saint Daniel in fight with lions on its altar. The other two important churches from that time were located in Cista and in Proložac. There is also a shine near Vrljika spring Opačac, built by Benedictines in the 6th century on a land received from Roman emperor Justinian. The Franciscans have inherited the property in the 14th century. The first record of their presence in Imotski county is from 1390 in "Conforomitates vitae" by friar Bartul from Pisa. They changed the location six more times before settling in Imotski. The land become the property of Francheschi family after the Turks' defeat. The shrine was renovated and used in religious purposes, but eventually abandoned, so it has subsequently decayed. Roman Dalmatia was under constant attack from Barbaric tribes Huns in 375 A.D. who started people migrations and Goths. But, it was the Avars who have destroyed most of the Dalmatian settlements, not leaving one stone on another at the beginning of the 7th century. During that time the Slavic tribes have started moving into the region. In part they were mobilized by Avars who were more adept in political organization and conquest. After the defeat of Avars in front of Constantinople the Croats have started founding their countries. Avars disappeared after being assimilated by their former subjugated peoples. Imota administrative region have appeared during Trpimir's rule, 845-864. Decorated stone from the fortress on the left is a good indicator of the age of the fortress. Zupania ta Hemotha, with it's fortress (castrum) as a center can be found in the Byzantine Emperor Constantine Porphyrogenitus chronicle, "De administrando imperio," written between 948-952 A.C. He wrote that Croatia was divided in eleven administrative regions: Hlijevno, Cetina, Imotski (Hemotha, pronounced Emotha), Pliva, Pset, Primorje, Bribir, Nin, Knin, Sidraga, and Nina. Župa was an administrative unit corresponding to a size of a county today. It was govern by a Župan or chieftain. Župa Imota bordered with river Cetina at the west boundaries, with mountains Kamešnica i Zavelim on the north side bordered with župa Livno. From Zavelim the border line went to Vitina, and from there over the mountains to Vrgorac and Adriatic sea. župa Imota was sometimes put together with župa Gorska. That is a plausible explanation of name Gorimita that is found in few sources, the most famous one being "The Kingdom of the Slavs," by Benedictine priest Dukljanin of Bar from the Montenegrin state of Duklja, written between 1177 and 1189. It has often been wrongly called "Ljetopis Popa Dukljanina," which is the title of the third chapter. The original work, which was written in a Slavic language, has been lost, but a Latin version from the 17th century is preserved and kept in the Vatican. There was a string of Croatia rulers in the 11th century who have managed to keep the Tomislav's Croatia largely intact, even increasing it like Krešimir IV, but the lack of male successor, after King Zvonimir death in 1089, led Croatia to the Hungarian King Ladislav who was Queen Helen's brother. He invaded Croatia north of Gvozd hills and claimed the Croatian throne. After the initial turmoil the southern Croatian part chose noblemen Petar as a king. Peter has managed the take care of the ensued chaos, but he came in conflict with King Koloman (1095-1116) of Hungary after he tried to chase the Hungarians out of the northern Croatian parts. King Petar was killed on Gvozd hills in 1097 and Croatia lost its independence. Only with Pacta Conventa in 1102, Croatian noblemen recognized Hungarian King Koloman and his successors as rulers of Croatia. Croatia has managed to keep "de facto" the status of a state, but it was now ruled by Hungarian House of Arpad. There was a decline in Byzantine Empire around that time and a rise of Venetian republic that has started a power struggle with Hungarian to rule Dalmatian coast and towns. The towns had a long tradition of established local nobility and self rule. Town governing was initially modeled on the aristocratic communes of the Byzantine era, headed by priors. Under the Hungarian rule the communes saw more democratic governance that was transitioning to the emerging Italian model with independent podestás who were selected by local establishments from out of town candidates. Bela I (1131-1141) has managed to claim the whole Dalmatia, but Zadar, and a part of Bosnia and has proclaimed himself a king of those lands. He has considered those lands his vassal properties and in 1139 he gave them to his son Vladislav to rule. Around that time Hum ( central part of today's Herzegovina ) was formed. It was contested by Bosnian ban (viceroy) Stjepan Kotromanić, Hungary-Croatian king Ludovik I, and the Serbian Nemanjic dynasty. Pagania ( župas Rastok, Duvno, and Makarska ), Imotski county and parts of Serbia near upper Drina were joined to Hum around that time to form Zahumlje, but the original name Hum prevailed later on. Imotski county saw many different rulers as Hum changed hand. The Byzantine Empire under Emperor Komnen took advantage of post Bela I power struggle and had reoccupied almost the whole Balkan leaving Zadar in Hungarian and Croatian hands. The Nemanjić's were given Hum to rule and eventually have managed to get independent of Byzantine. They lost Hum after they were defeated by Croatian Herzog Andrija ( 1197-1205). It was known that duke Domaldo from Split got Imotski county to govern in 1210 after helping Hungarian king Andrija ( 1205-1235) to prevent his overthrow. At that time the Nelipić's, nobility from Sinj and Knin started a power struggle with Domaldo about Imotski county. That was a time of rise of powerful Croatian noble families who were de facto governors of their territories, often undermining the Hungarian rulers. That state of affairs prevailed till 1348 when king Ludovik I managed to break the power of most important and influential Croatian nobility. Hum was not very defined region and Imotski county was in and out frequently, often governed by the same Nelipić family. Duke Peter proclaimed Hum independence sometimes after 1205, but not for long before he yielded to Stevan The First Crowned in 1225 shortly after being recognized as a duke of Split. Family ties between Hungarians, Croatian and Serbian ruling families often lead to interesting alliances, so there are many claims on the region ever since. In 1242 Mongols (Tartars) reached all the way to Split, but gave up on conquering it after Kan Ogotay's death. On the way back they have ransacked the whole region, killing everybody on their way. Archdeacon Toma (1200-1268) from Split describes them as fearless looking, short with broad shoulders, having small eyes, and eating only meat and drinking buttermilk mixed with horse blood. Andrija Nemanjić became the ruler of Hum afterwards, but not for very long. He was defeated by Hungarian-Croatian kings and lost Hum forever after that. Ludovik III (1272-1290) was slowly losing grip on the power. so powerful Croatian count Pavao Šubić became the first Croatian Ban (the king's proxy) in 1283. Pavao was also a recipient of land gifts during the dynastic power struggle between House of Aprads and Angevins. By 1299 he has also ruled Bosnia. Soon after he appointed his son Mladen I there as a Bosnian ban. He also appointed his son Mladen II as a ruler of Hum, where Imotski county was at that time. Mladen II took Bosnian ban title after the death of Mladen I. Croatian ban Pavao has became the most powerful Croatian ruler, still dependent on the Hungarian dynasty, after the natural Croatian rulers in 10th century. The Šubić family descendants later become owners of the Zrin property which gave another noble Zrinski family, also called Šubić-Zrinski. They were very important family during the Croatian history. Mladen II inherited the power in 1312. In 1318 his title was "Ban of Croatia and Bosnia and a ruler of Hum lands," but he was contested as a ruler in Croatia and Bosnia by other nobility not being as strong as his father. To diffuse the tension he appointed Stjepan II Kotromanić as a Bosnian ban, the same man who later helped Carlo Robert remove him from power. Stjepan II Kotromanić got to rule Bosnia, Hum, and Dalmatia from Cetina to Dubrovnik. He even managed to take Upper Hum from Stevan Dečanski in 1325. Imotski become part of Hum again in 1326. The region of old Croatian zupas, including Imotski zupa become known as Završje under Stjepan II, so Imotski become a part of Bosnian state for quite some time, except in Ludovik's time (1357-1382). Serbia become very powerful state around that time under Dušan Mighty who wanted to return Hum back to Serbian rule. He was backed by Mladen III who married Dusan's sister Jelena against king Karlo. The wars become especially intense under king Ludovik who was backed by Stjepan II Kotromanić. Stjepan II penetrated into Serbia in 1349. Dušan Mighty retaliated by attacking Bosnia next year, conquering and ransacking it, but failed to capture Bobovac, the ban's capital. He reached all the way to Cetina, passing through Imotski. There is a folk story, most probably true because it is found independently in Serbia, that Dušan took 3 brothers Mrnjavčević, after being impressed with Vukašin Mrnjavčević in a hunting expedition, with him to Serbia and gave them large land holdings in southeastern Serbia with honors. Dušan retook Hum, but lost it soon to Stjepan II, who gave it as dowry to his sister Jelisava who become the wife of king Ludovik. Stjepan II's nephew Tvrtko took power after Dušan's death. He was unable to become independent from Hungarian dominance till Ludovik's death. However, he took the Serbian part of Hum in 1374 after Dušan's death and the collapse of Serbian state. He ncreased his holdings in 1376 by conquering Kotor and proclaimed himself as king of Bosnia and Serbia soon afterwards. Ludovik ruled Croatia and Imotski county till his death in 1382. Anarchy ensued after that because the Hungarians and Croats were unwilling to submit to his wife Jelisaveta and daughter Maria rule. Bosnian king Tvrtko took advantage of the turmoil and became the ruler of the regions in 1388. His heirs were very ineffectual, and the mighty nobility became de facto the rulers. Imotski county region changed hands among Bosnian nobility, king Zigmund, and Neapolitan king Ladislav. Ladislav is infamous for selling the rights of Dalmatia for hundred thousand ducats to Venetians in 1409, after realizing that he is losing control of it. In 1437, Hungarian King Sigismund settled all the controversies about Dalmatia with Venetians for ten thousand ducats. During the Stjepan II Kotromanić rule Bosnian heretics (called also Patarins, Bogumils in Croatian) appeared in Imotski county at the end of the 12th century. Stjepan II relied on Bogumils to consolidate his rule. Christian clergy, like bishop from Makarska, for example were forced to go to Omiš. Heretics form both Serbia and Croatia found Bosnia as a sanctuary, but with constant power struggle between larger countries bordering Bosnia Bosnian even the rulers often renounced the heresy. It is unclear how the heretics appeared. One theory claims that the local clergy did not know Latin, so their interpretation were adjusted to the local populous. Distrustfulness toward the foreign clergy and rulers also help the deviations from Rome. 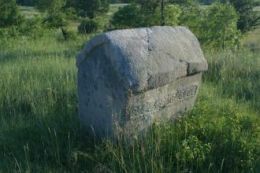 What is most often associated with Bosnian heretics are numerous tombstone monuments. The monument is called "stečak" in Croatian. The monument are different from te similar tombstone monuments in Bosnia and Herzegovina (Hum). They are marked by years they were created. The most of the monuments date from 14th and 15th century. During the Turkish rule in 16th century the custom had disappeared. It is alleged that most of the Bogumils have embraced Islam. 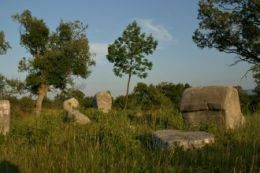 The monuments are located mostly near Berinovac, Cista (see images below), Lovreć, Krivodol, Lokvičići, and Zagvozd. There are two different kind of monuments: those all in one piece and those made from two pieces, the bottom one made as sarcophagus. Some of the monuments have a cross, meaning that several religions have used them. Most of the time they are dedicated to important persons. On one of them is written: "OVDI LEZI DOBRA ZENA VLADNA POLAG' SVOEGA SU ENIJA JERKA KUSTRAZICA A OVI BILIG' POSTAVIH JA ZB RATIOM" or in translation to English "a GOOD WIFE VLADNA LIES HERE OF HER HUSBAND JERKA KUSTRAZICA ...". There are small ornaments and a text of dedication on most of the monuments. Over the time the text become very difficult to decipher, so on only few of the monuments the text was transliterated. Local people were very reluctant to disturb the dead, so most of et monuments were preserved. The letters were in Croatian Cyrillic. Cista tomb monument or "stečak"
There are only scattered written documents about Imotski from the medieval era. In one document from 1246. g. officer Radošević is mentioned as a commander of Imotski fortress. It is also known that the Nelipić's built the Franciscan monastery at the beginning of the 14th century. The monastery was mentioned for the first time in 1343. 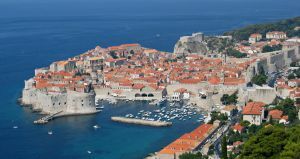 In a document from 1378, Dubrovnik republic asked Imotski duke Embrich to send 1000 soldiers to Ston to help out in their fight with Venetians. Imotski was a border region and had very important strategic position, so it is no surprise to find such a large number of available soldiers. In another document from 1378 (August 28.) 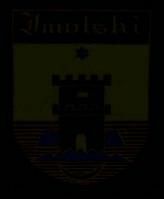 Imotski duke Embrich has proclaimed castello of Hum territory (castellanom terre Chelmi) or future Herzegovina. The first person from Imotski is mentioned in a register from Split in a connection with a dispute: "judices de terra Kalm nomine Grubac Maslouic, Nelipce Rubcich et Crasimir de Ymota" or in translation "Judges of Hum Grubach Maslovic, Nelipac Rupcic and Krasimir of Imotski." Imotski fortress also belonged to Herzog Stephen of Santo Saba or Hrvoje Vukčić Hrvatinić at the beginning of the 15th century. Hrvoje Vukčić was known for his military successes, but it was Hrvoje Missal from 1407 that made him better known. It is the most decorated Croatian glagolitic document. He also left a directive written in Latin from 1408, stored in Split. After his death in 1416 Ivan Nelipić took possession of Imotski. Imotski county was part of Hum since 1404 when a Bosnian decree put it under Sandalj Hranić rule. From 1435-1466 Hum was ruled by Herzog Stjepan Vukčić Kosača. Kosača has also lived in Imotski old fortress which was repaired by man called Ljubomir. 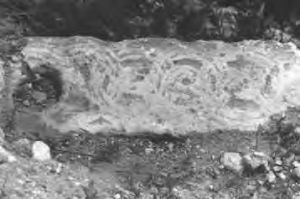 Wilkinson in his "Dalmacia and Montenegro" writes that: "A stone was found in one of the walls with an inscription recording its restoration by Lubomir* who is supposed to have been a Bosnian prince, before the Turkish invasion". Stjepan's son Vladislav took the fortress from him in 1452 after a quarrel because of Stjepan's wild life. 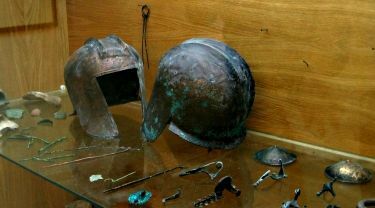 That same year Venetians have recognized Vlatković's brothers possessions in Imotski County. The Vlatković's become the rulers of Imotski county before the it was conquered by the Turks. Turkish occupation of Imotski county in 1493 has brought great change in the life of its inhabitants. Moslem population and administration was brought to Imotski and to its fortress. Some native people embraced Islam, mostly out of convenience. The Turks have considered Imotski militarily important region, so the fortress was reconstructed and fortified. The Turks let the conquered people speak their language and practice their faith, although the latter was made very difficult sometimes. All the land was property of the Sultan and as such was given away as desired. The subjugated natives were required to wear only black, pay heavy taxes, do work for beys and to do other things for higher ranking people. The most severe tax was in blood, the most able male kids were taken away to serve in the Turkish army. Pretty girls were taken into harems. There are many Turkish documents (called defters in Turkish) deposited in Franciscan monasteries chronicling the life under Turkish occupation. The guerilla style resistance put up by the displaced people, known as uskoks and hajduks, against the Turkish rule was very brutal as there were the Turkish reprisals, having disastrous consequence for the local population. Their suffering is well described in "Libretin" diary recorded by friar Pavao Šilobadović 1662-1686. There were three administrative units that were covering the region of conquered south Slav lands: "sandžak," "kadiluk," and "nahija" in decreasing order. Kadija or Turkish judge was at the head of kadiluk which consisted of few nahijas. Large nahijas had "naibi" who was appointed by kadija. Makarska nahija had naibi, which was appointed by Imotski kadija. Imotski kadija became famous by having a role in the most beautiful Croatian ballad "Hasanagnica." Imotski was a nahija initially which belonged to Foča and then to Mostar kadiluk. Imotski kadiluk was mentioned for the first time in 1562. Its nahijas were Imota, Duvno (Rog), Buško Blato, Ljubuški, Posušje, Gorska Župa, Fragustin, and Primorje. Nahijas Gorska Župa, Fragustin, and Primorje later belonged in Gabela kadiluk, after it was founded in 1598. Nahijas Duvno and Buško Blato become parts of Duvno kadiluk in 1633. Only nahijas Posušje and Imota belonged in Imotski kadiluk when the Turks lost Imotski in year 1717. In addition to Imotski, Proložac become very prominent village in Imotski county during the Turkish occupation. There are many forts and towers (kula in Croatian) that were built by Turks there and in the Imotski county. They served for rich people to live there and for defending the nearby population. Most of the inhabitants have left the region leaving the region depopulated except for a few mountain Biokovo close villages. Large population movement were in 1493, 1537, 1594, and 1597, and in 17th century especially during Candia (Crete) and Morea (Peloponnesus) wars, and at the beginning of the 18th century. The Venetians were actively calling the Franciscans to move the people to their territory and join them. Thanks to the Franciscans there are preserved documents telling how the life was under Turkish occupation. The Franciscans were persecuted and constantly on the move. In the last years of their rule the Turks came to a realization that the severely depopulated country was not self-sufficient and that was contributing almost no taxes. They invited the church back hoping that the common people will follow, but the former had to leave again in 1715 taking many natives with them to Omiš and then recently freed Zadvarje. The history tide changed after the Turkish defeat in front of Vienna in 1683, but it took 34 years and in 1717 Imotski and its county was liberated by Venetian and local people and came under the Venetians rule. Imotski county became a border region with Turkey now. While some people have returned back to their homes Imotski county was very much empty and devastated after the Turks defeat. The land was not cultivated that year and the constant state of war has took its toll on the region. Many people were brought from Bosnia and Herzegovina to populate Imotski county. Venetian leader Mocenigo has reported that Matissa Alilovic has brought 240 families from Herzegovina in 1718. 180 Greek Orthodox families, Serbs and Montenegrins were brought from eastern Herzegovina after the boundaries were changed and they were left within the Turkish rule. Only thirty Turkish persons, most probably descendents of natives who adopted Islam years ago, stayed in the county taking the Christian faith. Slowly craftsmen moved in from coastal Croatia towns and from Italy. The peace treaty from Požarevac from 1718 has determined the current borders between Croatia and Bosnia and Herzegovina. Imotski valley was administratively split into two parts, western controlled by Venetians and eastern by Turks. The border around Imotski was determined how far cannon bullet could reach, producing semicircular boundary. The Venetians were favoring the developed coastal regions when it came to modernization, so there was little progress during their rule. They did pretty well in organizing the county life. The biggest hurdle was how to attach immigrated people from Bosnia and Herzegovina to land and instill property ownership that was not guarded all the time. 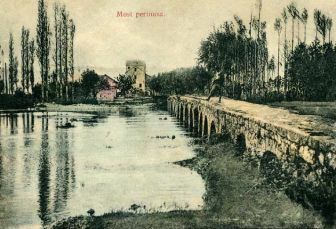 Outside people were brought to administer the region, starting from podestás or town governors as it was done in Dalmatian towns already in the beginning of the 13th century. The church and selective individuals in administration had great privileges, the latter's descendants inheriting the titles. The Franciscans were in constant clashes with Makarska bishops, but they have survived being supported by local people. Nevertheless, the Venetians approved Imotski monastery which was built in 1738. Bureaucracy had low wages and was making up the difference with corruption. The common people were largely left alone without much incentives to change a very bad situation in agriculture. The roads were not renovated and their conditions became worse than in the Roman times. The natives served in the Venetian army to defend the borders and as needed. It helped that the Venetians used Croatian or Illyrian language, how it was sometimes called. There was only one school in the whole county in Imotski where friar Paško Prgomet was a teacher. In addition to a couple of quarantines due to "cordon sanitiare" rules there was only one hospital in the whole county in Kamen Most. There were two well know books from that time, "Razgovori Ugodni Naroda Slovinskoga" ("Pleasant Conversations of the Slavonic People"), published in Venetia 1756 by famous poet and educator friar Ivan Kačić-Miošić and "Cvit Razgovora Naroda i Jezika Ilirickoga Aliti Hrvatskoga" ("Best Instruction of Illyrian or Croatian People and Language"), by friar Filip Grabovac. The latter author was imprisoned in infamous Venetian prison Sotto i Piombi and driven almost mad. His health deteriorated, he was released and soon died in a monastery. Those were the last years of the Venetian republic when the old system was coming to the end, unable to change itself and being threatened from the reformed France and Austria in the nearby neighborhood. It did not take long for Venetia to fall in 1797. Napoleon gave Dalmatia to the Austrians to rule after making a secret pact with them. Released Dalmatian soldiers came back and started spreading bad impressions of the French since they were very liberal and indifferent towards religion. The Franciscans joined the agitation towards the French, especially Imotski friar Andrija Dorotić. He knew that the large church land possessions were in collision with the French revolution ideas, but was not aware of the secret pact, but the people were even suspicious of Austrians, who were of German heritage and spoke a foreign German language. They were pleasantly surprised when Austrian general Mate Rukavina spoke to them in Croatian language. The following year there was a separation of civil and army rule, but general Rukavina did not stayed to keep his promise to unify Croatian lands. The civil governor of Dalmatia Rajmond Thurn started a policy of making Italian language in civil service by bringing Italian bureaucracy from Italy, effectively squashing the Croatian unification of territories under the same ruler. People rebelled in 1798 and moved into neighboring Bosnia. Only former colonel Francesco Dandolo, who was moved from Split to Imotski, was able to fix the bad situation after being made governor of Imotski. The Austrians had great plans to fix very bad situation in Dalmatia by building roads, revamping the postal system, and building civil schools. Civil engineer Zavoreo made plans for Dalmatian roads, but only the Zadar-Knin-Šibenik road was completed, the rest of them were largely built by the French. They forbade free planting of tobacco and introduced cultivation of potatoes. Austrian had many initiatives to change the situation in Dalmatia, but their rule came to the end when they defeated by the French in Austerlitz November 2, 1805, losing Venetia, Istria, Dalmatia, and Boka Kotorska. The French moved to Dalmatia to be closer to Turkey boundary, expecting her to collapse soon, hoping to be able to claim portion of its occupied territories. Russia was already in the region making a naval blockade in Adriatic sea together with Britain. The Russians were given Boka Kotorska by marquis Ghislieri instead to the French. General Lauriston went to a conquest to get back Boka Kotorska. Dubrovnik Republic provided him and the army a safe passage. They even made a reception for the French commanders, not expecting them to occupy the Republic which lost its independence on May 25, 1806 after several centuries. Dalmatia was put under Italian kingdom with Napoleon as a king. People did not like the French much and started insurrections backed by the Russians all over Dalmatia. The largest battles were fought in Poljice Republic and in Makarska. The insurrection was squashed by the French, but the Imotski governor Danese has managed to avoid providing any help to the French. His treason was uncovered and he was given death sentence together with two of his commanders, but managed to escape to the Austrian territory before the discovery. The commander's sentences were commuted to life imprisonment. The French were disliked even more after they started forced army service that lasted 4 years. Dalmatian men started escaping to Austrian territory forming volunteer army, ready to take on the French. The 1809 war between the French and the Austrians started successfully for the Dalmatian volunteers who have freed part of middle and whole south Dalmatia. That effort was in vain since the Austrians lost the war and made even greater concessions to the French. The insurgents, including many from Imotski county were put in front of a firing squad. The situation become improved when the French formed Illyrian Province from Croatian lands and Slovenia in 1810. That lasted till 1813 when Napoleon was defeated in Leipzig. The French managed to do many good things during their very short rule. Torture was eliminated and more humane treatment of prisoners was installed. People become equal in front of law. Privileges and various titles were also eliminated. Civil marriage was instituted. The installed reforms managed to improve cultural and economic conditions. Dalmatia got its first Croatian and Italian newspapers. Tobacco and potato cultivation was improved, forestation encouraged, and fruit tree planting, especially mulberry subsidized. The French started building roads in 1807. A well known "Napoleon road" Grabovac-Zagvozd-Župa-Rašćani was finished in 1809. Unfortunately, the rest of the roads were left in a design stage. Health service was improved and doctors started vaccinating people and making village visits. Imotski got a primary school in 1807 in Italian language which was favored to Croatian. The French rule was short lived after their defeat in Russia 1812 and near Leipzig in 1823. The Austrians moved to Dalmatia before even getting the territory as agreed during Vienna Congress, 1814-15. The installed their system in the life of the Imotski town and county. People were disappointed with the Austrians before long since they have kept certain changes from the French rule. The Franciscans lost many of their rights under Joseph II laws. Frantz Joseph had abandoned absolutism and returned to constitutional monarchism in 1848. Those were the years of Illyrian movement which goals were use of Croatian language in schools and offices and unification of Dalmatia with Croatia and Slavonia. The free press order resulted in appearance of many newspapers and periodicals. With it came increased political activity and national awakening. The National party candidate Ante Rossi won elections in Imotski 1864 and become Imotski representative in Dalmatian Congress (Sabor) which was situated in Zadar. The next year the Italian Autonomists lost the county elections and the National party took the leading position, but the old autonomists bureaucratic nucleus remained. With the loss of Venetia in 1866 Austrians lost a base from which they imported bureaucracy into Dalmatia, so continuing the use of Italian language become absurd. Imotski county gave 200 sailors in the naval fight near Vis between Italians and Austrians, where the Italian fleet was badly defeated giving the Italians a severe setback in their ever lasting conquest and claiming of Dalmatian coast. Imotski sailors were recognized for their heroic contributions. Only in year 1870 the National party was able to defeat its opponents and change the operations of the governing bodies making Croatian the official language in Imotski. It took three more years to remove Blaž Vučemilović from the county secretary position so after that time all the major functions were in the National party hands. In 1870 National party won the Dalmatian elections and in 1873 has introduced Croatian language in Dalmatian Congress. Don Mihovil Pavlinović, Imotski representative was chosen as Dalmatian representative in Vienna. He even won the populist elections to be a representative of Makarska, Imotski, Vrgorac, and Metković counties in Vienna. By 1875 the situation become very complex in Bosnia and Herzegovina. There were many local insurrections near its boundaries. The Austrians were helping the Turks to normalize the situation just enough to have situation tolerable, so they could start diplomatic maneuvering that led to their Bosnia and Herzegovina occupation in 1878, after getting a permission from power nations in Berlin Congress on May 13 the same year. Don Mihovil Pavlinović died in 1887 after seventeen years of serving the people of Imotski and Dalmatia. He died in Podgora, where he was born in a family that escaped Turks from Imotski county. He was replaced by Luka Vuković in Dalmatian Congress and by don Frano Bulić in Emperors Council. Those were the major changes in politics till 1914, the year of the Great War or World War I. The economy of the region has started improving during the second Austrian rule. Vegetables planting become the main emphasis, particularly of potatoes. Tobacco and grapes become very important. Flooding was still a problem, so several irrigation projects were started, resulting in marginal successes. Only in 1947 a tunnel, that was built after 9 years of on and off work solved the irrigation problems. There was no industry, but craftsmanship was on the rise. The roads were repaired and the trade blossomed, making Imotski people famous as merchants. At the beginning of the 20th century County House, the Court House, and a large Tobacco warehouse were built. Post offices were modernized or built all over the county. The county had ten elementary schools. Only the health service was lagging behind with just one physician per more than 3 thousand inhabitants. The number of inhabitants had tripled during the second Austrian rule, from 14 to 42 thousands, despite heavy emigration to USA. 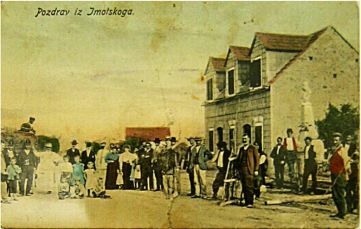 People of Imotski county started work engagements in Western Europe, maintaining the homes in the county. That started scattering of Imotski people all over the world. The end of WW I brought many changes and a new country: The Kingdom of Slovenes, Croatians, and Serbs. This is a separate topic that requires detail examination. Since it is readily available in a written form elsewhere, it will not be handled here.